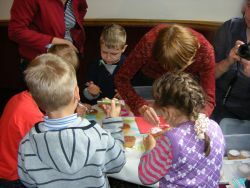 By Joan: The Chernobyl Childrens Project (UK) supports children and families in Belarus, the Country most affected by the Chernobyl disaster. As part of this project they bring children to Britain for recuperative holidays. Earlier this year we were pleased to be able to raise £130 towards this. On Monday 16th July 2012 together with a free room from the Labour Club we were able to provide a party to welcome them all to Glossop. The children had a wonderful time with games food and prizes.Everyone left with Goody Bags and a smile on their face. The most heart warming moment was when the children recited Russian poetry for us and mothers cried in unison SPASIBA (thankyou). Nothing can make up for what these families have to face but hopefully just for a few hours we were able to show them that someone cares. More photos of the party can be found here. 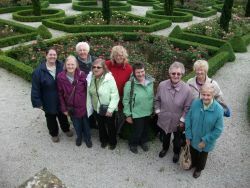 By Sara Jayne: On a typically variable English summer day, ten members enjoyed a lovely day out to view the summer rose gardens at Hopton Hall, in Carsington, Derbyshire. After our adventures navigating around road closures due to flooding and road works – I mean, after enjoying the scenic route to the hall – we found a warm welcome in the tea room at Hopton Hall, located at the top of the walled garden, which was absolutely full of roses. The sun came out as we finished our tea and cake, and we then set off and enjoyed walking around the 2km of trails through the gardens and around the ponds, seeing a variety of flowers and plants along the way, along with some ducks with ducklings on a pond. After taking in the sights, we made our way to The Miner’s Arms pub in Carsington, where we found a large table to suit us, and a satisfying repast. We then set off home again, having enjoyed our time together on our lovely day out. Take a look at the Photos page for more pictures of the day.